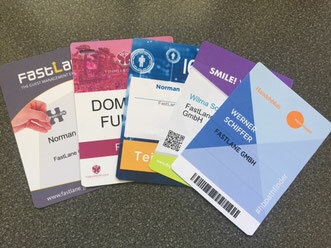 Name tags are the central tool for most onsite services at events. They are used, for example, for networking, access registration or important information sharing. And yet no product is as neglected as they are. And it can be so simple! The biggest problem with badges is faced by many event planners at their events: An appropriate layout and also the number of badges must be provided a few weeks before the event so that they can be pre-produced in time and in a given quantity. Changes in the graphics or increases in the number of participants after the start of production can then no longer be taken into account. To be on the safe side, more will be produced or, in the worst case, if the noShow rate is slightly higher, a lot can quickly be thrown away. 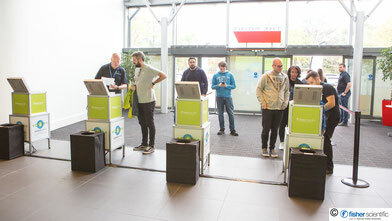 Our Full-Colour-Live-Badging System takes up exactly this problem: We print the digitally stored layout live and in full colour as soon as the guest arrives at the counter - and within a few seconds. It doesn't matter whether you are using a single layout or 10. The system selects the right one according to the participant category (e.g. participant, speaker, organization, etc.) and prints it with the personalized fields (name, first name, company, etc.) on the badge. Different coloured markings, e.g. sponsor logos, coloured banners, dots etc. or visually very different badge layouts for different groups of participants without any pre-production - no problem. The advantage: The layout can be transmitted only shortly before the event, in extreme cases, e.g. in the case of changes, it can also be exchanged at the event and at the end only the actually printed badges are billed. Another advantage: Due to the flexibility of the layout, important information such as individually booked workshops, advertising and sponsor logos for different target groups, agendas or the seating at the evening event can be printed on. Our badges are available in different sizes and variants, e.g. including vouchers, in credit card or postcard format and as bracelets. Even at small events you don't have to do without these comfortable badging services. With the Badge2Go solution, we provide event planners, even with 30 seminar participants, with individual, personalized badges including all the advantages of the live badging system directly into the event location and without any technical effort.